In this tutorial you are going to learn how to end an eBay listing before the auction is finished. Go to eBay and make sure that you are logged into your account. 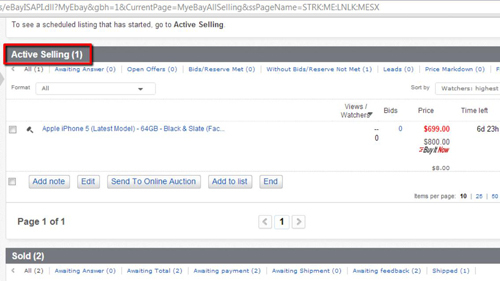 Hover your mouse over the “My eBay” button at the top of the page and in the menu that appears click “Selling”. Scroll down to the part of the page that is called “Active Selling” and find the item that you want to end early. To the right of the item click on the “More actions” option and in the menu that appears click “End item”. At this point you might have to log into your account again. You will now need to choose a reason why you are ending the item early, here we are selecting that it is no longer available. 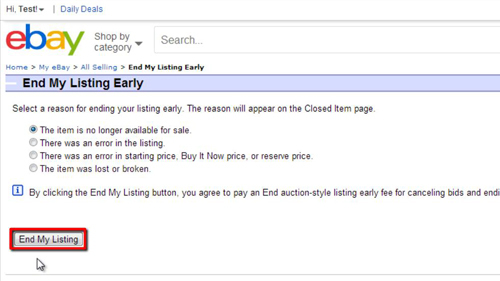 Click “End my listing”, you will then be informed that the listing has been ended and that is how to end an eBay listing.